Work on a £500M ‘Cardiff Embankment’ mixed use regeneration programme is expected to begin on site in Spring 2015, with potential creation of 3000 jobs during the construction phase. 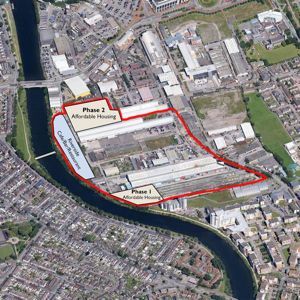 This follows developer BPL (Bellerophon Partnerships Limited) securing all required contracts with landowners, allowing the City of Cardiff Council, in its economic development role, to back the Welsh developer’s plans. BPL will deliver a major housing element of the project in partnership with Linc Cymru Housing Association. The scheme, also known as the Dumballs Road regeneration scheme, will deliver 2,150 homes, a primary school, local retail units, coffee shops, bars and restaurants at the site located between Cardiff Bay and the city centre. BPL chief executive Richard Daley said: “This is an historic day for Cardiff. Dumballs Road is the only area of land in the city centre that remains in dire need of regenerating and has been a blight on the landscape for far too long. The 33 acre project site is recognised as one of the most important brownfield regeneration sites for housing development in the council’s Local Development Plan. City of Cardiff Council leader Phil Bale said: “The council is pleased to support BPL and Linc in the delivery of this major city centre regeneration.